So when my mam asked me to make her a birthday card for a bingo buddy (oh lol) I jumped at the chance, While making this card I realised I cannot tie a bow to save my life, yes I can tie my shoes !! but making it look pretty, I cannot do. 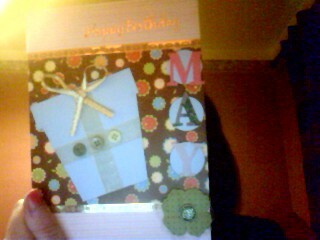 So heres the B-day card. I'm still a major lover of layering. I got some pretty green brads from papermania recently MAJOR LOVE! Go lovely with my Papermania buttons and flowers, also green. Happy days! So, i've been drafted by the mammy darling to make the many many cards we need for the terribly big Irish family we have. I hummed and hawed over what layout to use and how i could churn out loads without it being terribly time consuming. Unfotunately, my first couple where to time consuming and I would not get 20+ cards out of all my current supplies. 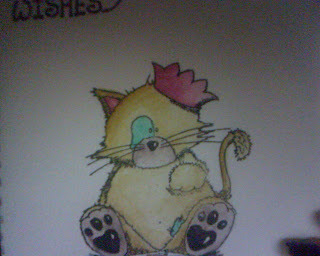 So, while in Eason's today i bought some outmeal and nutmeg cardstock and i just ran with it. 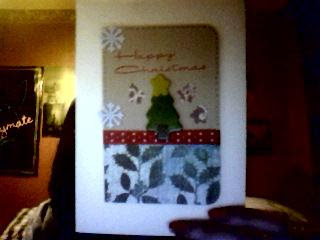 Timed myself making this card, 10 mins which is great for me as i've often sat over a card for over two hours. I like what i done, its interesting to look at without being overly abundunt in brads and glitter. So here's the first one. Do I keep torturing myself by watching YouTube video's of things I cannot have. All those Two Peas in a Bucket papers and punches, all of the Stampin' Up collections and stamps, Michaels, Big Lots, Tuesdays Morning hauls. I'm gonna have to either rob a bank or move continents. 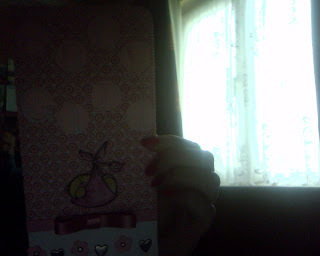 Again, I'm so sorry this is taking with my web cam. My camera is completely on the blink lead or no camera lead. Its not even saving/reading the pictures I'm taking. I think I know what St. Nick might be bringing me for Christmas! My second package arrived today (watercolour pencils + other goodies!) and it was the same delivery man as yesterday. I think i might have an addiction alright because when i opened the door to him he was like "here's your package, another one *smiles*"
My Crop-A-dile arrived this morning. I have been utterly riveted (lol) by it, took me a few tries to get it working (Ooh, you have to punch a hole first, do'h) but i've been punching holes all morning. Ordered more stuff this morning, yes after my new box of goodies arrived, its got that bad. Weighed up whether to get Promarkers or watercolour pencils. Decided on watercolour penciles as I was a mad fanatic about watercolour paints as a kid and have a lot of experience with them. Got my blender markers too, even some paintbrushes so i'm all ready to go. 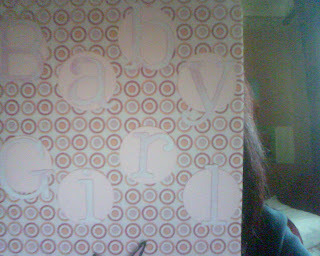 Plus i've got a baby girl of a close friend on the way in the next week or two. I feel a card coming on! 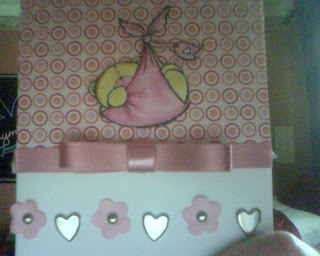 I've recently fallen head over heals with card making. So, i'm starting this blog to kind of give me the kick in the a**e that I need. I wanna see how I progress and have swore to myself I will update as soon as I put my craft scissors down. These are my first two attempts at making some cards. As you can see I will give nobody a running for their money! But that's what I love about this, mistakes sometimes make a card, and nothing is more personal than a card someone put time and effort into. I hope to be making alot more soon. As soon as Tuesday and my new Crop-A-Dile arrive!!! !